People of all ages gather and ride bicycles along Adams Street in downtown Brownsville, Texas, during an evening CycloBia in June 2014. Every Sunday in Bogotá, Colombia, more than 70 miles of roads are closed to vehicular traffic so nearly two million people can walk, bicycle, skate, dance, play games, socialize or simply sit and relax in the middle of the city’s streets. The weekly gathering, which began in 1976, is called the Bogotá Ciclovia. One of the most successful car-free, open streets programs in the United States takes place in Brownsville, Texas, a city of 175,000 along the U.S.-Mexico border. In 2012, city leaders seeking to address Brownsville's high rates of poverty, obesity and diabetes found inspiration from the Bogotá example (which you can see in the video at the end of this page) and decided to host its own "CycloBia." The unusual spelling of Brownsville's ciclovia is purposeful, to make the word appear more similar to "cycle" and to include a "B" for Brownsville. People travel from near and very far to participate in the Brownsville CycloBia. Visit cyclobiabrownsville.com for the dates of upcoming events. To look for an open streets gathering near you, visit the Open Streets Project. To see video of a recent open streets day in action (and hear from Gil Penalosa, the founder of the Bogotá Ciclovia), check out the Via RecreActiva sidebar and video on the next page. About the Brownsville CycloBia, Rose Gowen, a physician and elected city commissioner notes, "The program is not just fun and it's not just about health. Downtown merchants and restaurants along the route have seen substantially higher sales receipts on CycloBia days and nights. They are seeing that people moving down a street on foot or on a bike spend more time noticing their storefronts and sampling what they have to offer than those who whiz by in a car. They have also learned that 10 bikes can park in one parking space in front of their store or restaurant, and that 10 bicyclists buy more than what one or two people buy after parking a car in that same space. Our CycloBia gets people off the couch and out and about being active. It stimulates the economy, it’s fun, and — best of all for the participants — it's free!" Dr. Gowen joined Art Rodriguez, the City of Brownsville’s director of public health, and Kendra M. Stine, Brownsville’s wellness manager, to explain the why and how of the Brownsville CycloBia. WHEN: CycloBia Brownsville is a quarterly event. The first CycloBia was held in the fall of 2012. Since then, several additional CycloBias have been held, including some CycloBia Nights programs, each of which attracted more than 10,000 people. Each CycloBia is four hours long. For each CycloBia, the event's planning committee selects a designated route through Brownsville's historic downtown, city parks and low-income neighborhoods. The first two CycloBias featured a linear route of seven miles; subsequent events have revolved around a two-mile rectangular route so cyclists and pedestrians can remain within easy reach of event amenities, programs and rest stops. The ultimate goal of the Brownsville CycloBia is to reduce the rates of chronic disease among the city's residents by promoting healthy eating and active living. Surveys indicate that people who come to the CycloBia have increased their physical activity after attending. Studies about ciclovias in other cities have also shown increased physical activity for participants. A more active community results in lower rates of obesity and, consequently, fewer people with Type 2 diabetes. "Our CycloBia gets people off the couch and out and about being active. It stimulates the economy, it’s fun, and — best of all for the participants — it's free!" Increasing physical activity coupled with making healthier food choices is important in Brownsville for both health and economic reasons. Illness results in higher costs for individuals as well as for the community-at-large. Wellness results in a higher quality of life, and it attracts business to the city. "Livable communities are communities that people want to be in," Dr. Gowen told AARP in a 2014 interview. "I challenge anyone to tell me what city in the U.S. — or the world — is vibrant and livable yet filled with a lot of sick people." For a ciclovia to be successful, many pieces need to fall into place. Initially, the first step is to identify a founding partner or partners: Who or what group will take the lead to organize, advocate for and launch the ciclovia? If the local government isn't already involved, elected leaders and municipal departments need to be educated about what the event is and why it's a good idea. Identify and recruit additional stakeholders and develop a planning committee. These individuals or groups can come from the public sector (local government), private sector (area businesses and hospitals) and nonprofit world (social welfare, health and other organizations). This committee becomes the core group of individuals and organizations that are vital to making a ciclovia or open streets event possible. The committee meets monthly and organizes the before, during and after logistical aspects of the event. Identify a preferred route for the ciclovia and coordinate with the local police, traffic and public works departments to assist with road closures, security and waste management. Make decisions about advertising, and raise or allocate money to market the event. "The identification of funds to support the event must be and is always reviewed and appealed for from varied sources," notes Stine. 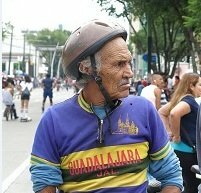 AARP transportation expert Jana Lynott traveled to Guadalajara, Mexico, to participate in the city's Via RecreActiva, a weekly, 41-mile open streets event. Read her blog post about the trip and watch her video (below), which includes an interview with Gil Penalosa, father of the Bogotá Cicolvia and founder of 8-80 Cities, a nonprofit that works to makes cities more walkable and livable for people of all ages. Every Brownsville CycloBia has several rest stops, or "reclovias," which serve as health-promoting activity hubs where people can relax and learn about healthy lifestyle choices. Each reclovia is sponsored by a local organization that, in turn, recruits vendors, businesses and programs to fill the reclovia. Vendors are required to promote either a healthy eating choice or physical activity. Reclovia activities have included free bike rentals and helmet giveaways, bubble soccer, CrossFit obstacle courses, fruit-infused water samples, Zumba, line dancing, restaurants serving healthy choices from their menus, bike repair stations, glucose screenings, street yoga, fitness classes and workouts, outdoor games for children, bean bag tosses, etc. Many organizations throughout the community have stepped forward to participate in the Brownsville CycloBia. Among the teams that helped launch the event were several departments within the City of Brownsville government, the University of Texas School of Public Health, Healthy Communities of Brownsville and the Brownsville Community Improvement Corporation. Vendors have included large retailers including GNC and the H-E-B grocery chain; the local bicycling businesses JT Cycling and Bicycle World RGV; the bike advocacy groups Bike Barn, 7 on 7 and BikeTexas; community nonprofits such as H.O.P.E 4 Kids Living with Diabetes; small businesses including RedFish Recycling; academic sponsors such as the University of Texas at Brownsville Health and Human Performance Department and the Brownsville Independent School District. The Brownsville community needed convincing before the first CycloBia. Part of the resistance was due to concerns about closing roads to vehicles for an open streets event. Also, for a lot of residents, bicycling — and bicycling for fun — was an entirely novel activity. "Many people in Brownsville did not have bicycles or did not know how to ride a bike," Rodriguez explains. "Those who could ride a bicycle mostly did so as a means of transportation, not for enjoyment and physical activity." Brownsville restaurateurs say they’ve been able to pay two months of taxes after only one event that brought people in on foot or by bicycle. A major hurdle was that, as a whole, Brownsville residents were not physically active or especially aware of or motivated by the health consequences they faced. In an age of electronics and technology that requires or supports being sedentary, taking part in an activity focused on fitness requires a significant change of behavior. Once the CycloBia happened, and then happened again and again, more and more people in Brownsville and the surrounding areas learned about the event. "They look forward to it and enjoy it!" says Rodriguez. "People now show up at the events in the thousands, and we’re regularly asked when the next CycloBia will occur. Bike rentals at every CycloBia are exhausted and the demand to have more rentals available continues to grow." Adds Stine, "The more that people in the community learned about CycloBia and experienced it for themselves, the resistance to the event and spending a day being physically active decreased." Funds to pay for the Brownsville CycloBia are raised from community sponsors and appealed for from various municipal resources. The main costs for the events include advertising, promotional items, logistical support (administrative staff, security, trash collection, traffic management) and expenses for rented facilities, such as portable restrooms. Since its inception, the City of Brownsville and the South Texas grocery chain H-E-B has sponsored CycloBia Brownsville. Always provide water stations along the route and have a water sponsor, such as a local business or organization, take responsibility for supplying and managing the stations. It's best to either provide small recyclable paper cups and/or promote the usage of refillable water bottles that people bring on their own. Welcome to a lifelong home. Require all vendors and reclovia sponsors to provide their own tables and chairs and, if it's a daytime event, tents for shading. Establish one or more first aid stations along the event's route and identify locations and access points for emergency personnel and vehicles, if needed. Many of the businesses that are located along the route are supportive of the event as they've seen their sales rise dramatically on CycloBia days and nights. Several restaurateurs say they've been able to pay two months of taxes after only one event that brought people in on foot or by bicycle. People who take part in the CycloBia embrace the event. ("It has become a local favorite!" says Stine.) As noted, the CycloBia helped Brownsville win the National Civic League All-America City Award and Robert Wood Johnson Culture of Health Prize. The plan is to have at least four CycloBias in 2015 and to "roam" them into each of the four districts in Brownsville. Roaming the route throughout the city will increase visibility and grow participation. It will also give more vendors and businesses an opportunity to realize increased revenue and, says Stine, "understand that healthy programing can be economically beneficial for themselves and to the city as a whole. Our hope is to grow the number of CycloBias each year and expand into neighboring cities in Cameron County." For information about CycloBia Brownsville, contact the City of Brownsville Health Department, Wellness Division, at 956-547-6351 or visit cyclobiabrownsville.com or the City of Brownsville on Facebook. For information about age-friendly, open streets programs that promote walkabilty and active living, visit 8-80cities.org. To learn about AARP Livable Communities' work in Texas, contact AARP Texas at 866-227-7443. Melissa Stanton is a program manager for AARP Livable Communities and editor of AARP.org/livable. Get a taste of the weekly Via RecreActiva in Guadalajara, Mexico, and hear from Gil Penalosa, father of the Bogotá Cicolvia and founder of 8-80 Cities. Also, read a blog post by AARP transportation policy expert Jana Lynott about the Via RecreActiva and the overall benefits of open streets programs.